On Tuesday, Chinese media reported that one of the cotton seeds aboard the Chang’e 4 lunar lander sprouted, marking the first time that any biological matter has ever grown on the moon. 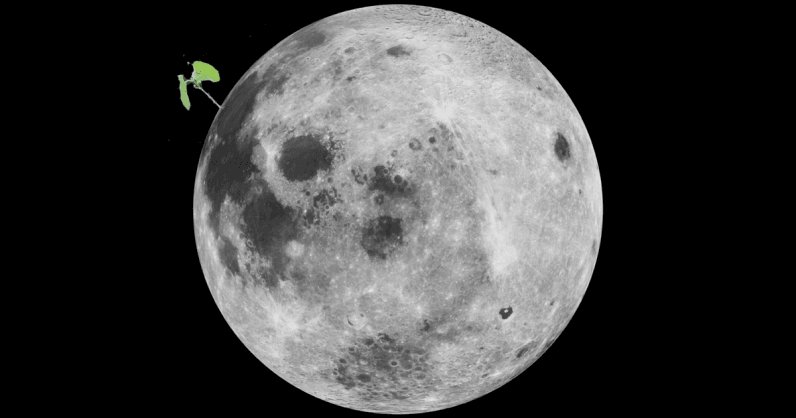 Unfortunately, the sprout died after nine days upon the beginning of the lander’s first lunar night on Sunday. That’s because temperatures drop to -150 degrees Celsius during lunar nights on the moon, and according to Xie Gengxin, chief designer of the experiment, life inside the canister would simply not survive those conditions. The experimental setup is encapsulated within a 19.8cm tall container designed by 28 Chinese universities. The lander will provide water, air, and maintain a temperature of 25 degrees Celsius to help the plant grow. The scientists behind the experiment rendered the seeds dormant for two months – from the testing phase to when vehicle landed on the moon. They also included rapeseed, potato seed, rock cress, yeast and fruit flies with soil in the canister to see if these crops could provide additional resources for food and clothing on the moon. “We have given consideration to future survival in space. Learning about these plants’ growth in a low-gravity environment would allow us to lay the foundation for our future establishment of space base,” said Professor Liu Hanlong, the chief scientist behind this experiment. The Chang’e 4 lander – which landed on the lunar surface on January 3 – aims to explore the geology of the far side of the moon which is invisible from the earth. Hopefully, this development will make it easier to conduct more crewed missions to the moon and beyond in the coming years.